������ Roi Et town is built around a large artificial lake,Bung Phlan Chai,where a large,walking Buddha stands on a small island in its centre. Tall Buddhas are popular in Roi Et as Wat Buraphaphiram features a 68-metres walking Buddha,with a staircase that enables visitors to climb to knee-high level. Sixty kilometres outside of town, Ku Kasing is a large Khmer sanctuary dating from the 11 th century,and under restoration. Handicrafts are the province's main product,particularly the Isan khaen, a kind of panpipe made from wood and reeds. These are best made in the small village of Si Kaew. Thanon Phadung Phanit is a good place to buy silk and cotton fabric. Roi Et has an area of about 8,299 square kilometres, consisting of the following districts: Mueang, Thawat Buri, Selaphum, Phon Thong, Nong Phok, At Samat, Phanom Phrai, Chaturaphak Phiman, Kaset Wisai, Suwannaphum, Pathum Rat, Pho Chai, Mueang Suang, Phon Sai, Moei Wadi, Si Somdet, Changhan, Chiang Khwan, Nong Hi and Thung Khao Luang. From Bangkok, take Highway No. 1 to Saraburi and Highway No. 2 to Ban Phai, then take Highway No. 23 to Roi Et via Borabue and Maha Sarakham, a total distance of 512 kilometres. Bangkok-Roi Et buses depart from Mochit 2 Bus Terminal every day. Contact Transport Co.Ltd at Tel: 0 2936 2852-66 or visit www.transport.co.th for more information. There is no direct train running to Roi Et. Visitors can take a train to Khon Kaen, then continue the trip by bus to Roi Et. Call 1690, 0 2223 7010-20 for more information. PB Air flies one flight daily from Bangkok to Roi Et. For more details, call the Bangkok office at Tel. 0 2261 0220, 0 2535 4843-4 or Roi Et office at Tel. 0 4351 9577, 0 4351 2835 or browse www.pbair.com. Roi Et Airport is about 18 km. from the city. A shuttle bus from the airport to the city is available. Thung Khao Luang 26 kms. The picturesque lake on the area of 200,000 sq.m. in the central city is a symbol of Roi Et. It is blessed with a relaxing atmosphere, with an island decorated with a large flower garden. The pond also has various types of fish. Bueng Phalan Chai is also used as a venue for various events of the province. Inside is situated the city pillar shrine, the sacred shrine that is highly revered by the people of Roi Et. There is also a large walking Buddha image located amidst the flower garden, a Constitution atop a Footed Tray, flower clock, Phu Phalan Chai (an artificial waterfall), animal sculptures, playground and exercise areas. Situated in Tambon Bueng Klua, it is a large lake covering a total area of 7,500 rai, with water all year round. There is a vast white sandy beach on the bank, lined up with raft restaurants. It is one of the favourite spots for tourists who come for relaxation and water sports. To get there: From Mueang district, take Highway No. 23 passing Thawat Buri district and upon arriving at Selaphum district, take Highway No. 2259 for 10 km. and turn left and continue about 8 km. further. It is located at Ban Yang Ku, Tambon Ma-ue. Prang Ku is a complex of buildings with a plan that resembles the Khmer nursing home known as ‘Arogayasala’. It comprises the main prang, a library, wall and entrance pavilions, and a pond outside of the wall. The ruins are in good condition, especially the roof structure of the main prang which still maintains its three tiers and the lotus base of the pinnacle. Other ruins of the temple have been restored and are located in a shady environment. Apart from this, to the southeast inside of the front wall, there are many more archaeological finds being kept such as a sandstone lintel depicting a personage sitting on an elephant’s or bull’s back in a niche above the Kala face. The abbot of Wat Si Rattanaram where Prang Ku is located said the lintel belonged to the front porch of the main prang. There are also 2 fragments of colonnette; one with a hermit at the base, a large Siva Lingam with its receptacle – Yoni - and a fragment of the pinnacle’s lotus base, which was adapted to be the base of a stucco image of Phra Sangkatchai. Prang Ku was built during the 12th – 13th Century A.D.
To get there: From the city, take Highway No. 23 (Roi Et – Yasothon) for 10 km. until reaching Thawat Buri district, then turn left for 6 km. to Prang Ku. Or take Highway No. 2044 (Roi Et – Phon Thong) for 8 km., then turn right for just about 1 km. to Prang Ku. It is situated at Ban Tak Daet, Tambon Hua Thon. The architectural structure suggests that it is a traditional small ‘Sim’ – local dialect for Ubosot - of the Northeast with a low boundary wall. Its gable and ‘Rang Phueng’ – decoration underneath the lower tie beam – are elaborately carved. The Sim houses murals illustrating Buddhist stories. It is assumed that it dates back to around the Ayutthaya or early Rattanakosin period. Outside the Sim is situated an Isan-style Buddha image which was moved from Wat Tai Wilai Tham (same district). Sim Wat Traiphum Khanachan was renovated by the Fine Arts Department in 1998 and awarded for outstanding architecture by the Association of Siamese Architects under Royal Patronage in the year 1998. To get there: From Mueang district, take Highway No. 214 to Highway No. 215 until reaching Suwannaphum district, then turn left and continue for 5 km. It is situated at Ban Ku, Mu 2, Tambon Sa Khu. Ku Phra Kona comprises three east-facing brick prangs lying in the north – south direction, standing on a single sandstone base. They are surrounded by a boundary wall, with entrance pavilions or Gopuras in four directions; all were made from sandstone. The central prang was renovated in 1874 by plastering and making the roof into tiers. Each tier has niches of Buddha images in four directions. The front of the central prang was a ‘wihan’ of the Buddha’s footprint, decorated with the original six-headed Naga. The other two prangs were also renovated, but they remain in their usual styles; unlike the central prang which has been considerably changed. The northern prang was covered with a ‘sala’ building providing shelter for a gable depicting the Ramayana. Meanwhile, the lintel carving that represents the reclining Vishnu remains in situ above the front entrance. The lintel of the western false door was laid on the floor; it depicts the God Vishnu on his mount Garuda. The southern prang still has lintels above the false doors. The one in the north depicts a deity kneeling inside a stylised arch above the Kala face. In front, there is also a fallen lintel depicting the God Siva on his bull. There are also some causeway boundary stones lying over there. It is assumed that Ku Phra Kona formerly had a Naga bridge and causeway lined with boundary stones on both sides from the front entrance pavilion (Gopura) to the lake (Baray), which was located about 300 metres away. All sculptural features suggest that Ku Phra Kona probably dates from the Baphoun period, or the 11th Century. To get there: It is 60 km. from Mueang district along Highway No. 215, passing Mueang Suang and Suwannaphum districts. Then, take Highway No. 214 for 12 km. Ku Phra Kona will be on the left-hand side. There is a rubber plantation at the entrance and a lot of monkeys residing in the temple. It is located on Charoen Phanit Road. The old temple is believed to have existed before the establishment of Roi Et. The Ubosot was built during the late Ayutthaya period. In the past, it was used for the Oath of Allegiance Ceremony. At present, it is a venue for dharma practice and is known as Sunthon Thamma Pariyat School. The Ubosot houses beautiful murals depicting the life of the Lord Buddha. For more details, call Tel. 0 4351 2400. It is located in Roi Et city. 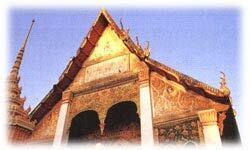 The third-class royal temple was formerly known as Wat Hua Ro and was later renamed as Wat Buraphaphiram. There is the tallest standing Buddha image in Thailand known as Phra Phuttha Rattanamongkhon Mahamuni or Luangpho Yai, which was built with reinforced concrete in the blessing attitude. The Buddha image is 59.2 metres tall and if the base is included, it would be 67.85 metres tall. There is a museum at the base. Luangpho Yai is highly-revered by the people of Roi Et. It is a public park in the heart of the city, located in front of the city hall. The park was founded in 1986 on an area of 225 rai. It is decorated with a variety of flowers and shady trees. The highlight is the fountain in the middle of the park and a clock tower. There is also a public library. The park is used as a venue for various cultural occasions and events of the province. Located on Phloen Chit Road, near the city hall. It was initially established by Dr. Ko Sawatdiphanit with an aim to showcase local silk textiles and handicrafts of Roi Et. It was later renovated when the Fine Arts Department had the policy to set up a national museum. Today, it showcases the province’s geography, natural resources, archaeology, history, way of life and local hand-woven silk products. The museum is open every day, except for Mondays, Tuesdays and public holidays from 9:00 a.m. to 4:00 p.m. The admission fee is 30 baht. For more information, call Tel. 0 4351 4456. This large pagoda enshrining the relic of the Lord Buddha is situated in Wat Pha Nam Thip. It covers a total area of approximately 151,242 rai, comprising steep and complex undulating sandstone mountains with abundant dry evergreen forest, deciduous forest, and deciduous dipterocarp forest. Fauna found in this area include boars, barking deer, foxes, monkeys, squirrels, etc. The interesting sight-seeing spot is Pha Phu Thai, which is the best point to view the sunrise; and Pha Mok Mi Wai is the best spot to view the sunset. There are also two nature trails of about 2 km. and 3 km. which tourists can trek by themselves. The park provides accommodation and camping areas for those who want to stay overnight. Reservations should be made in advance to the Head of the Northeastern Literature Botanical Garden, Pha Nam Thip Non-hunting Area, P.O. Box 1, Tambon Bueng Ngam, Amphoe Nong Phok, Roi Et 45210. Pha Mok Mi Wai : Situated inside Pha Nam Thip Non-hunting Area, it is the best viewpoint and is covered with mist all year round, as it is an abundant area with high humidity. So the area is shady green and perfect for nature lovers. To get there: From Bangkok to Khon Kaen, take Highway No. 2, the Khon Kaen – Nong Phok route, take Highway Nos. 209 and 2116 from Nong Phok to Ban Tha Sa-at, for 9 km. Turn left from Ban Tha Sa-at and drive for 13 km., to the Office of the Pha Nam Thip Non-hunting Area. The large stone cliff is situated at Ban Khok Klang, Tambon Pha Nam Yoi. It borders Nong Sung district of Mukdahan province and Kuchi Narai district of Kalasin province. The total area is about 20,000 rai. It covers a forest with wide varieties of hardwood trees and is home to various kinds of wild animals such as boar, barking deer, deer, red junglefowl, etc. Pha Nam Yoi rises 200 metres from the ground level, and 380-500 metres above sea level. On the hill is situated Wat Pha Namthip Thep Prasit Wanaram, which covers an area of 2,500 rai. The temple was built by Phra Achan Si Maha Wiro, a follower of Phra Achan Man Phurithat. The temple houses Phra Mahachedi Chai Mongkhon, one of Thailand’s largest chedis that was designed by the Fine Arts Department. The white chedi is embellished with golden motifs, and surrounded by smaller chedis at the eight directions. The large chedi is 101 metres wide, 101 metres long, and 101 metres high situated on a piece of land with an area of 101 rai. It houses the relics of the Lord Buddha and is beautifully decorated with a mixture of an ancient and contemporary-style of art. This Phra Mahachedi Chai Mongkhon is situated in the compound of Wat Pha Namthip Thep Prasit Wanaram. Floor 1: The large hall for multi-purpose use and meetings. Floor 2: The ‘Sala’ for assembly of the monks. The pictures on the walls depict the life of the Lord Buddha. Floor 3: The Ubosot, which houses a collection of 101 life-like marble images of highly-respected monks of the Northeast and models of monks who have practiced well. Floor 5: Winding staircase of 119 steps leading to the bell-shaped hall where the Buddha’s relics are enshrined. To get there: Take the Roi Et – Phon Thong – Nong Phok route. It is about 80 km. from Roi Et, along Highway Nos. 2044 and 2136. This land used to be an expansive, dry, harsh place in the middle of the region. It covers 5 provinces which are Roi Et, Surin, Buri Ram, Yasothon, and Maha Sarakham. One-third of the area is in Roi Et. There is a legend that says the Kula people were traders in ancient times who were also great fighters with excellent stamina. However, they cried when they got to Thung Kula Rong Hai because it was such a desolate place without water and big trees. Nowadays the area is fertile due to the efforts of the government to develop it and is suitable for agriculture. The development centre is 6 kilometres from the district office, a bit past Ku Phra Ko Na. It is situated in Wat Burapha Ku Ka Sing, Tambon Ku Ka Sing. It is another huge temple with Khmer-style architecture, comprising three prangs on the same laterite base, and rectangular library buildings in front. All of them are surrounded by a wall, with entrance pavilions known as Gopura at the four directions. Outside is a U-shaped moat surrounding the wall. The three prangs of the main building are situated on a single base in the north – south direction. They have a square shape, facing east. The central prang is larger than the other two prangs. It has a long antechamber with three entrances at the front and on the two sides. The base of the prang was made of sandstone and carved in various rows and strips of motifs such as lotus petals and the flame-like ‘kanok’ motifs. Inside the inner chamber of the central prang, there is a Siva Lingam, which represents the Supreme God Siva and fertility, according to the beliefs in the Sivaite Sect of Hinduism. Several lintels were also found here. One piece depicts the God Indra on his mount – the Erawan or Airavata elephant – in a stylized arch above the Kala face whose hands hold the garland. There is also a gable depicting the God Indra sitting on his mount, Erawan elephant, amidst the ‘kan khot’ or scroll motif. The other two prangs have the same size and common features, having a sandstone base and brick wall with a single front entrance. There are pedestals of sculptures inside. Considering the art style, architectural plan, as well as archaeological evidence, they show that Ku Ka Sing followed the pattern of the Baphoun style of Khmer art, which is dated around 1017 – 1087 A.D. It was meant to be a shrine dedicated to Siva, one of the supreme gods in Hinduism. To get there: There are two routes to get there; follow the Roi Et – Kaset Wisai route or Highway No. 214 for 47 km. and continue further on the Kaset Wisai – Suwannaphum route for 10 km. Turn right to Ku Ka Sing for 10 km; or take the Roi Et – Suwannaphum – Surin route (Highway No. 215) and continue onto Highway 214 for 60 km. until reaching Wat Ku Phra Kona. On the opposite side, there is a route to Ku Ka Sing, which is about 18 km. further. It is situated at Ban Nong Muen Than, Tambon Nong Muen Than. It features a small ‘Sim’ of traditional northeastern style. Its gable and ‘Rang Phueng’ (decoration underneath the lower tie beam) feature fine woodcarving with a wooden shingle roof. Outside is decorated with mural paintings. They depict the life of the Lord Buddha when He subdued Mara - devils, hell, and the Great Renunciation when the Lord Buddha cut his hair and the God Indra took it to be enshrined at Chedi Chulamani in heaven. The murals inside the Ubosot illustrate the folk tale of ‘Sang Sin Chai’. They are believed to date back to the early Rattanakosin period. To get there: From Mueang district, take Highway No. 2043 to At Samat district, continue for 10 km., then turn into Ban Nong Muen Than for 2 km. This is in Tambon Pha Nam Yoi, 85 kilometres from Yasothon. Plants here are from Thai literature like Phra Wetsandon and Lilit Phra Lo. There are also herbs categorised according to their medicinal attributes. It is located in the city on Hai Sok Road. The temple houses Luangpho Phra Sangkatchai (Kaccayana), a sacred Buddha image highly revered by the people of Roi Et. It is not known when it was built. In 1782, Phraya Khattiyawongsa (Thon), the first founder of Roi Et, discovered this image and relocated it to Wat Sa Thong to be the image of the city. In the past, all civil servants had to make a promise before the image that they would be honest in their work. It is located at the centre of the Sai Nam Phueng Roundabout near the Roi Et College of Dramatic Arts. Phra Khattiyawongsa (Thon) was the son of Thao Chan Kaeo. He was appointed to be the first ruler of Roi Et in 1775 during the reign of King Taksin the Great. He was the leader in setting up this city, by migrating people from Mueang Thong to settle at Mueang Kum Rang or Mueang Roi Et. He was considered a great ruler as he could restore the city until Roi Et became one of the most prosperous cities in the region. It is located near Bueng Phalan Chai. One of its twin buildings comprises an auditorium, lecture room, exhibition room, office, a ticket booth and a souvenir shop. The next building features an aquarium comprising 24 small tanks and one 8 x 16 metre tank with a capacity of 400 cubic metres of fresh water and a ‘bio filter’ system, which shows fresh water fish. The highlight of the exhibition is the underwater tunnel through which one can view the movements of the marine animals from any direction. The aquarium is open everyday (except Mondays, Tuesdays and public holidays) from 8:30 a.m. – 4:30 p.m. The entry fee is 30 baht. For more details, call Tel. 0 4351 1286. It is a huge temple built from the abbot’s omen. It was embellished and decorated with local earthenware, so it looks strikingly eye-catching. The entrance of the multi-tiered chedi represents Hanuman’s mouth. Each floor of the chedi has murals illustrating the life of the Lord Buddha. At the temple’s gate, there are two huge tortoises which look like Khmer or Indian art. To get there: Take the Roi Et – Thawat Buri – Selaphum Road. It is about 13 km. from Thawat Buri district and about 30 km. from Roi Et town. The entrance is on the right side. The park which was set up to commemorate the 50th Anniversary Celebrations of His Majesty’s Accession to the Throne is situated inside Wat Bo Phan Khan Rattanasophon. It is also where the beautiful image of Phra Phuttha Sahatsakhantha Mahamuninat is located. To get there: Take the Roi Et - Phanom Phrai route from King Amphoe Nong Hi to Tambon Den Rat. It is approximately 85 km. from Roi Et. It is the regional literature botanical garden of the Northeast situated in Dong Ma-i National Forest Reserve, Tambon Pha Nam Yoi, about 86 km. from the city. It covers a total area of about 1,000 rai, featuring plants mentioned in Thai literature such as the Vessantara Jataka, Khun Chang - Khun Phaen, Lilit Phra Lo, Lilit Taleng Phai, Buddha’s history, etc. There is also an herb garden. The entire garden has a lively atmosphere.